BEFORE I got behind the wheel last week, I was ready to shred the Chevrolet Corvette Stingray — and not in a good way. I had already sharpened my dagger, just itching to plunge it into the ‘Vette’s soft, midlife-crisis belly and rip. The weapons will have to wait for another day. After a week of feeling the muscles of the uncommonly powerful V8 flex underneath me — become part of me — I realised: Never before has a car changed my mind so quickly and so completely as this one has. The best/worst was this: “Owning a Corvette is a great way to let people know you didn’t always have money.” All of those were from the audience that should have wanted to buy this car — personal friends of mine who are educated males of means in their early thirties. Last year Chevy sold 34,000 ‘Vettes. This year, so far, it has sold 11,986 of them, up 2.5% over the same period in 2014. The company hasn’t commented on who is buying them, but I can say, anecdotally, that I have never seen a woman, a person of colour, or anyone who looked to be under the age of 50 who wasn’t an auto journalist driving one. (Barbie, with her fly pink version, doesn’t count.) That’s driving one on any street, at any time — let alone owning one. Turns out, it’s their loss. Yes, the Stingray screams like an animal as it blows down the street, which can be obnoxious, and the huge hood covering the bulging V8 engine is phallic by any measure. (You get a bundle of “Compensating for something?” jokes when you drive this.) The sheer lack of subtlety in any form with this car, whether in its styling or its performance, advertises a driver who seems desperate for attention. It’s unnaturally hot to drive and miserable over cobblestones, or in traffic. But when you drive it fast, it’ll make your veins pop. I had more fun in this vehicle than anything I’d taken out in the past six months, and that includes the BMW i8, Mercedes-Benz SL variants, and the Jaguar F-Type. I had so much fun with it that I drove for 10 hours one day around Long Island beaches, then drove it out to Southampton and back on a whim to fetch a friend. The Corvette Stingray is certainly not for everyone. But anyone in the market for a two-seat convertible toy for weekend driving should give it serious consideration. You can drive 137kph in fourth gear — and there are seven gears on its manual transmission. (An eight-speed automatic version is available, but please don’t be a baby and get that.) It also has a new rev-matching function, which increases shifting efficiency and finesse. Driving it feels real, for the first time in your life. It’s not as if you’re in a futuristic spaceship (BMW i8) or a race car (Porsche 911), or on a thoroughbred (Mercedes-Benz SL). Driving it feels as if you have become the car. You feel every piston, every sinew, meld, and thrust immediately when you want, where you want. It’s as if your hands on the wheel and the wheels on the ground are one and the same. Even think about turning, weaving, swaying, and the ‘Vette will take you there. The Corvette strikes in a straight line with the certainty of a cobra. But its steering is as responsive as any I have ever felt. It will squirm, fishtail and screech if you ask it to. The chassis is arrow-straight, stiff as an iron rod. Shifting it feels as smooth as a marble mantle. You get the sense that it has much to give. And rather than fighting you like an old Challenger or Charger, the Corvette Stingray aims to please. I do not like how this car looks. It’s too ballsy for me, with no sense of elegance or refinement. I wish it evoked more of the slim classic Corvette look. But you might like it: The hood is spread wide in front, with an angry air duct front and centre, sides rounding over the front tires and a flat open grille straight across the lower bridge. The smallish xenon headlights sit angled up, far apart on either side, like the eyes on a camel. From the side, the body has been carved out and then tucked at the ribs before a straight line juts toward the sharp rear. It’s almost geometric in its severity. The quad air exhaust pipes are grouped in a clod at the back, which is flat across the top over the trunk and squared off on either end. There is no softness here, anywhere. The quality of the trim inside is sufficient but not exceptional. It’s much improved over previous iterations, with GT-style bucket seats covered in bright red leather that feels cheap, compared to anything you’ll feel in a BMW or Land Rover. Carbon fibre accents are available. The real problem inside, though, has to do with dimensions. A 1.91m friend who got inside yesterday struggled at first to fit his lanky legs behind the dash. (This may also have had something to do with his fashionably tight jeans.) We both found ourselves ducking a bit to see stop lights — the top edge of the windshield hit us nearly at eye level with the top down. Speaking of the top, it’s an automatically powered ragtop that deploys in noticeably longer time than those found in the Mercedes SL and Bentley Continental convertibles. It’s not sealed well enough, with the top up, to keep it quiet inside — also unlike the Merc and Bentley. The button to retract is tucked under the steering wheel on the dash, to the left. It’s out of the way, but nonetheless oddly placed. Another odd feeling: using a heads-up display while driving a stick. (Most premium cars these days don’t even offer manual versions.) 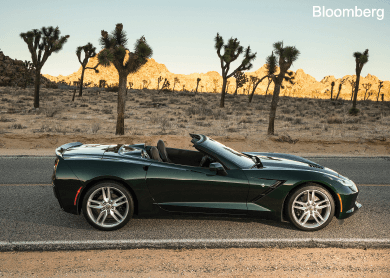 That duality encapsulates something pretty major about this car — it serves as commentary on how Corvette must straddle a half-century heritage with an attempt at relevance in the modern age. You will sense this struggle if you buy this car. You’ll be forced to explain it in real time to your friends and lovers when they ask why you bought it, rather than something — anything — else. This article first appeared in The Edge Financial Daily, on May 25, 2015.